As you may already know, Act of Valor is unique in that it has real Navy SEALS, not actors, in the main roles. They mix it up with some professional actors as the lines between reality and fiction are blurred. We thought that was a pretty novel approach, and it has no precedent that we’re aware of. Interestingly, it seems this project started life as a training video, and somehow rolled into becoming a feature-length, narrative film that played in theaters. That might explain the presence of the two directors, as it seems fairly obvious which are the “training video” scenes (glorious shots of aircraft carriers, planes, and men diving out of them) and which are the “added to become a movie” scenes (everything else). Please don’t take that as a negative, however - as stated earlier, we appreciated the melding of the seemingly disparate elements to forge a (relatively) cohesive whole. Perhaps because of its training video origins, it all looks highly professional and glossy (check out the Blu-Ray for best results), and it has some old-school action standbys that we all love and enjoy - the shooting, blow ups, guard towers, and even some Prerequisite Torture. It’s a fairly simple “heroes and villains” plot, and thankfully there are no kids mucking it all up. Because the plot is so basic, it probably would have helped the movie if it was streamlined down to about 90 minutes or so from its almost two-hour running time. 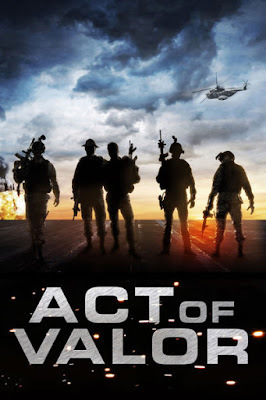 Perhaps one of the best things about Act of Valor is the camaraderie between the SEALs. And sure, their acting is a little wooden - but they’re NOT ACTORS. Cut them a break. Besides, you can’t make fun of them, because they’re busy saving our lazy, review-writing butts from the real-life bad guys. Because this was such a surprise hit in 2012, it definitely paved the way for other hugely successful, audience-pleasing films such as Lone Survivor (2013) and American Sniper (2014). Everyone should see all three. Someone in Hollywood probably thought “if this is working so well with non-actors, what would happen if we brought in the pro’s?” The results speak for themselves. 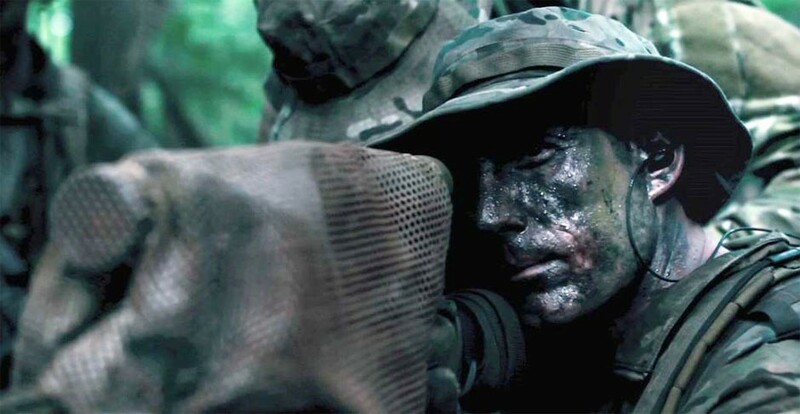 The American people have a hunger to see what’s going on in the military, and these three films provide that in a current context, which is important for us to see. The whole experience is pretty unusual, and the fact that one of the main baddies is named Christo we took to understand that the filmmakers were saying that pretentious art like wrapping Central Park in cellophane or wrapping tropical islands in cellophane, or, heck, wrapping anything in cellophane is an act of terrorism in and of itself. In the end, though, watching Act Of Valor may leave you with one question: "is joining the Navy SEALs right for me?" For our part we decided we would skip the grueling training and dangerous missions and do the next best thing: support movies like this.